Research!America is a nonprofit public education and advocacy alliance that works to make research for health a higher national priority. Based in the Washington, DC metro area, the alliance represents academia, industry, patient advocacy organizations, scientific societies, academic health centers, independent research institutes and foundations. Research!America works to ensure that Congress and the administration sustain the National Institutes of Health (NIH), Centers for Disease Control and Prevention (CDC), Agency for Healthcare Research and Quality (AHRQ), Food and Drug Administration (FDA), and National Science Foundation (NSF) at funding levels that keep pace with scientific discovery. They also advocate for federal funding for global health research and a legislative and regulatory climate that stimulates growth in industry research and development. For more information visit researchamerica.org. 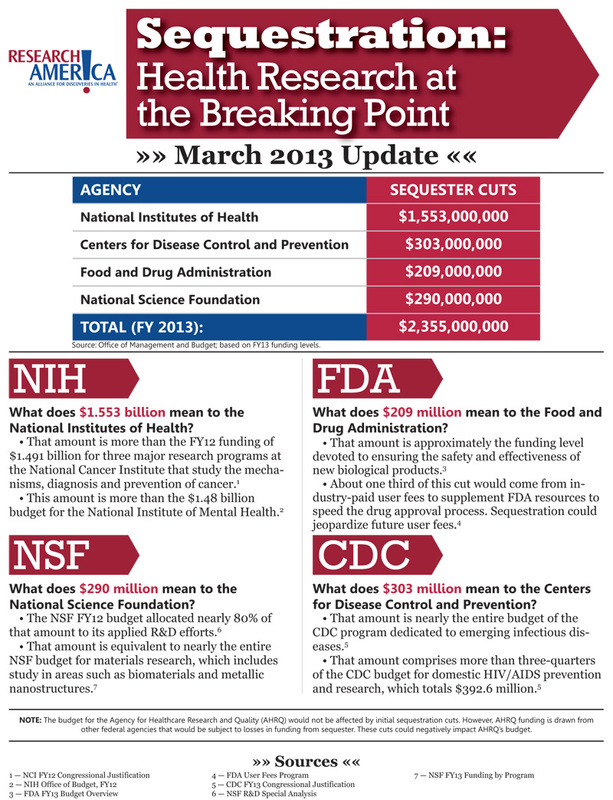 This fact sheet shows how the major funders of science and health research in the United States would be affected by mandatory spending cuts if the "sequestration" does not end.